Accused of terrible war crimes that he can't remember committing, the eleventh Doctor goes on the run with his companion Alice Obiefune, along with a mysterious amnesiac who calls herself The Squire and the legendary Dalek killer himself, Abslom Daak! As they dig deep into the history of the Time War in the hope of clearing the Doctor's name, the bounty hunter called The Then and The Now, a hideous perversion of spacetime, tracks them at every turn! 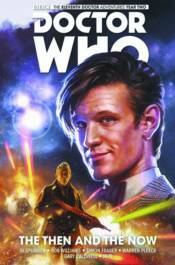 Collects Doctor Who: The Eleventh Doctor Year Two #1-5.